July brings the ring of freedom! Tears at times! Laughs, food, drink, and heat makes the ruts in Memory Lane for The USA! July 4 is significant in flag waving and fireworks celebrating what we call Independence Day. Vacations, pool parties, ice cream making, first tomatoes fall from their vine while sunflowers and Zinnias show their faces for weddings and other celebrations. Let’s share our July with one another! Dynamite representation of Old Glory! As eyes brim with tears and lumps in throats pervade our patriotic hearts we give testimony to the Lord God Almighty to Whom we dedicated this great nation. As I explain to my students when we are learning the patriotic hymns and songs of the nation….it is not the red, white and blue ‘cloth of the flag’ that we honor, but what and whom it represents…the ‘people of the cloth’… the citizens and inhabitants of the USA. Long may it wave in the the home of the brave. Happy 4th of July to everyone! Love the artwork and words on the above picture, Dawn. Your expressive words, Sara, really make July come in with a bang. 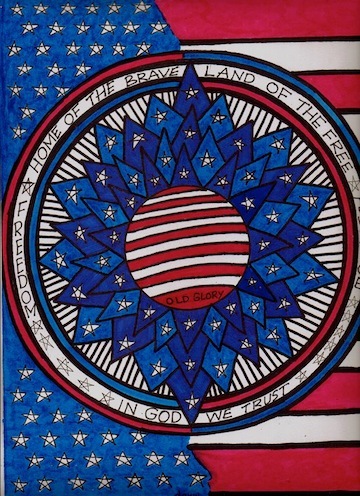 I especially like to read “Laughs, food, drink, and heat makes the ruts in Memory Lane for The USA!” And Dawn’s artwork makes ‘Old Glory’ burst forth with much meaning and depth to think about. I love the clothes and how they wear in the month of July in the locale of which I live. I feel as thou I have tamed the lions that roar with cold winds, snow and storms. I feel the warm breezes that gently blow with scents of lime, lemon and rose. I wear their colors and feel the emotion of bottle scents while I stroll the curbside pubs with brain sensors signaling bare foot, shoed or socked you owe a part of the wonders of the world! Sara, your sensitivity in searching out & discovering the ‘God-NESS’ in the world around you encourages me, not to plod, plod, plod but to look around with expectancy…that is to find some delight, some lovely surprise in God’s creation…in my everyday world; in noting someone’s socks and shoes or bare toes; in the lovely scents as we pass cosmetic counters; seeing a chubby-cheeked toddler with a big pink bow; to the wafting of cinnamon from the bakery…and then indulging and sharing a fat, frosted roll. Ah, yes. God is good, indeed. Thank You Lord. “…while sunflowers and Zinnias show their faces for weddings and other celebrations.” Sara, I love the way you give these flowers a personality. Zinnias sure give maximum output per seed in the garden. Every time you cut one and put in an arrangement or vase, more blooms grow back. Must be why one of the most popular varieties is called ‘Cut and Come Again’. Debi, your quote on Zinnias’Cut and Come Again.’ may be the reason church altars in my child’s mind and eyes were built for the Zinnias. Maybe I should tract my faith like the seed of a Zinnia…. Sara, you & Debi are both in error!!! The glorious Hibiscus plant at my door is an over-achiever. Blooms, blooms, blooms….bud after bud after bud. Orange and pink. Just a zealous and glorious plant. Ha! Debi. You picked it out for me, Sad for you. Glad for me. Zinnias…okay! Hibiscus…glory of God!!!!!! I win. Your mention of church altars as a child, Sara, brings a floral memory to me. My mother had several plants that flowered at my childhood home, that I can recall, and each at its own season which marked that season in my remembrance. There were the early spring daffodils for Easter celebration; the lilacs, which brought their fragrance, signaling spring had arrived; the peonies on the fence line to honor Memorial Day; the bearded iris that always seemed to be blooming when the June rains came; the roses where each new bloom was waited for in expectancy; the sweet peas to sweeten the summer night air; and the zinnias, harvested throughout the summer. When it was my mother’s turn to do the church altar flowers, she depended on one or more of these to provide what she needed for her service to the church. The abundance of flowers, both imported and domestic, that we can readily obtain from many stores today was not available, to my knowledge, in our town in those days. She could always depend upon her zinnias, sown carefully each spring, for summer altar flower days. Right I lose because I have neither bloom. Whomever sees the bloom wins! I may be learning a new lesson; maybe the holding on to a wilted bloom may make me miss the wonder of repeated beauty in slighyly different forms, yet same bush. Holding on to a wilted bloom or leaving a ‘spent’ bloom on a growing plant may prevent more blooms. Most annual or perennial plants need to be regularly ‘deadheaded’ (removing dead or spent flowers) to encourage continuous blooms throughout the summer season. I rejoice on this 4th of July in the freedom by which Christ Jesus has made me [us] free. May the LILIES also enjoy this holiday, this day of remembrance of our great, God-ordained American heritage. July says maybe it would be a neat idea to find an old book and reread for the fortieth time! Out jumps a mystery like a nugget of truth that had lodged quietly beneath the rock of what seemed like the only truth. Reading seems so divine on a hot sweaty July day? Didnt cost a thing but yielded a profit that might jump start a Jan-Feb cold frosty non-blooming snowy short light day. I think a great idea, grab an ice tea, dust the old book off and give it a try. If you don’t have one maybe the smell of a local library will double the pleasure as you scan the old shelves for a mystery that’s waiting to be read! Yes…it’s cool in the Library, too! BTW….the Bible is a VERY OLD BOOK that holds a bunch of mysteries. Good idea, Sara! I got a book in the mail today, early Birthday Gift, from my niece, Yvonne Harvey. “In The Company of Others” Jan Karon. Great fun for me. I read The Mitford Series and can’t wait to start this one. Looks like Father Tim and wife, Cynthia, are going to vacation in Ireland. Already brings back memories of my trek there a few years ago!